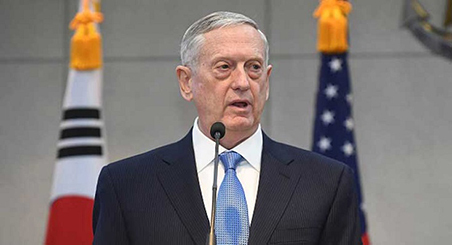 One thing can be said about the new Pentagon National Defense Strategy document just released under the name of Defense Secretary Jim Mattis. It is honest about what the target of US military policy is going forward. Washington military policy is explicitly aimed to keep China and Russia from developing any alternative counter-pole to unchallenged US military and political supremacy. The new document lays this out in no uncertain terms. The details are notable and show the disarray that is Washington today, as its once-firm grip on world power disintegrates .	.
To refer to the period as one of strategic atrophy is not entirely accurate for the power that has waged wars non-stop, direct and surrogate, from Asia to the Middle East to covert regime change operations around the world since it invaded Afghanistan in October 2001. Honest is the statement that the US strategic competitive military advantage has been eroding. This erosion, however is a direct consequence of the erosion of the US economy and the increasingly desperate efforts of Washington to dictate to the world according to their wishes and not respecting sovereignty of nations or peoples. The key phrase is “Inter-state strategic competition, not terrorism, is now the primary concern in U.S. national security.” What is this “inter-state strategic competition” that relegates the so-called war on terrorism to the back seat in priority? It is, simply said, the emergence of significant economic, technological and military powers and alliances that feel strong enough to assert their own national interest. For the Pentagon, which operates under the 1992 Wolfowitz Doctrine, strategic rivals to US sole superpower dominance, is not to be. This suggests that in the eyes of Washington for other nations to abide by the rules of the present system, including of the UN, to “exploit” its benefits for their gain, is a heinous or criminal act. The terminology suggests that Washington feels China and Russia are driving their role in the world today at a speed that is not to the liking of the Sole Superpower. For its part, the Pentagon accuses Russia of seeking, “veto authority over nations on its periphery in terms of their governmental, economic, and diplomatic decisions, to shatter the North Atlantic Treaty Organization, and change European and Middle East security and economic structures to its favor.” The Pentagon insists, “The use of emerging technologies to discredit and subvert democratic processes in Georgia, Crimea, and eastern Ukraine is concern enough, but when coupled with its expanding and modernizing nuclear arsenal the challenge is clear. Conveniently omitted is the fact that it was Washington in 2014 that created what has been accurately called “the most blatant coup in US history” to install an anti-Russian regime of oligarchs and neo-Nazis in Ukraine and in Georgia, or that a citizen referendum in Crimea saw a vote of 93% to ask to become part of the Russian Federation, not of Ukraine. The idea Russia is out to “shatter” NATO conveniently omits the reality that Washington in 2003 broke solemn promises made in 1990 to the Russians that NATO would never expand eastwards towards Russia as a precondition for Moscow allowing German unification. And it was Washington that in 2007 announced the destabilizing placement of US missiles in Poland and other NATO states aimed at Russia in what was euphemistically termed US “missile defense,” in reality preparation for a US nuclear First Strike potential aimed at Russia. Moreover the CIA and State Department created color revolutions in Georgia and Ukraine in 2004 in a vain effort to bring NATO to the doorstep of Moscow. In sum the 2018 National Defense Strategy of the Pentagon is a de facto declaration that the US superpower, bankrupt and ailing as it is, will do everything imaginable militarily to block the upbuilding of Eurasia around the peaceful emergence of the Russia-China economic cooperation in terms of energy, financial cooperation, infrastructure as well as defense cooperation and anti-terror activities.